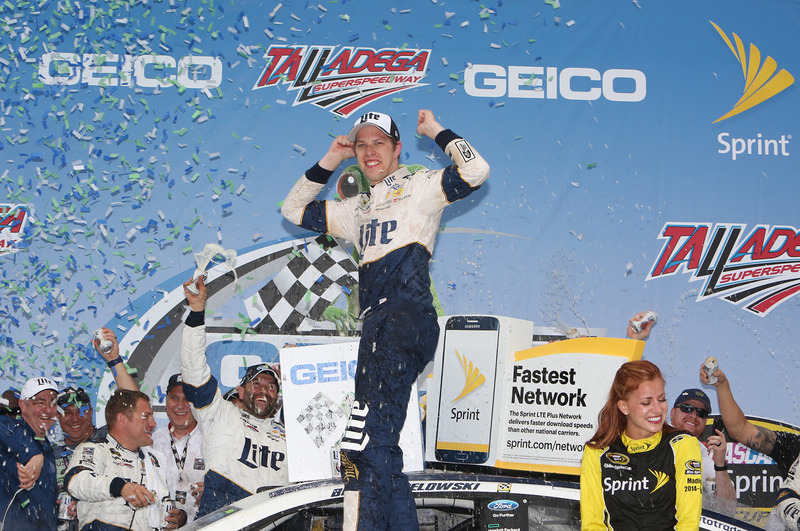 Photo: Brad Keselowski celebrates his GEICO 500 win in Gatorade Victory Lane at Talladega Superspeedway. This marks Keselowski's fourth win at the mammoth 2.66-mile track. TALLADEGA – With the start time of the GEICO 500 moved up in hopes to beating the rain showers, Talladega Superspeedway’s spring race was a nail biter from start to finish. The action-packed race was what fans expected at NASCAR’s fastest track on its 23 Sprint cup track circuit. The longest track at 2.66 miles also claims the steepest banking, all of which adds to the, at times, literal highflying action. Brad Keselowski, who led the most laps of the afternoon, added another Talladega victory in a typical caution laden restrictor plate race. Earning his first victory in 2009 at Talladega, today’s win brings Keselowski his fourth trip to Victory Lane in ‘Dega and his second win after ten races in the 2016 season. The race started with a front row of legacy drivers. Pole winner Chase Elliott is the son of 1988 Winston Cup Champion and NASCAR Hall of Famer Bill Elliott. Starting second was Austin Dillon, grandson of Richard Childress, team owner of Richard Childress Racing whose most notable driver was the late beloved Dale Earnhardt Sr.
Perennial fan favorite, Dale Earnhardt Jr, started the race in third place and was a victim of two crashes during the afternoon. His car was on fire briefly during his final caution before he called it a day and headed back to North Carolina finishing in 40th place. It was a sad sight for Junior nation as the Earnhardt family has a solid history of strong superspeedway finishes. With 33 of the 40 cars getting battered in at least one wreck, the 188-lap race left cars looking like they had finished a short track race like Bristol or Martinsville instead of Talladega. Even pit lane, with its 55 mph speed limit, wasn’t free of crashes with Danica Patrick being spun out on pit road by Paul Menard during a green flag stop on lap 39. On standby for Tony Stewart, who returned to racing just last weekend at Richmond after suffering a broken back in late January, was Austin’s younger brother, Ty Dillon. Stewart’s plan was to make the driver switch during the first pit stop under caution as the swap would be too costly, time-wise, during a green flag stop. Yet, that first green flag stop found Stewart speeding while exiting pit road and therefore serving a drive through penalty. The Stewart/Dillon driver change happened a mere 11 laps later during the first caution on lap 50 when Dale Jr. lost control of his 88. Spinning, he caused damage to the cars of David Gilliland, Matt Dibenedetto and his teammate Kasey Kahne. Notably, he opted for only a two-tire pit stop during the earlier green flag stop. Once again, pit road saw calamity with Denny Hamlin exiting his pit box and hitting the tail end of Greg Biffle on lap 52. Seven laps later, caution came again as Joey Logano pushed Martin Truex, Jr. into Michael Waltrip who then overcorrected to the right into the oncoming field. That wreck, on lap 59, also caused damage to the cars of Casey Mears and Aric Almirola. Almost 40 laps passed during which the drivers could catch their breath as best they could at speeds over 190 mph. Yet, with weather a strong factor and nearing the halfway point of the race when a winner can be declared if needed, the traffic stayed squirrely with over 20 cars within one second on each other. Seven cars wrecked on lap 96 with Chris Buescher barrel rolling several times before coming to a stop. Initialized by Jamie McMurray drifting up into Austin Dillon who was then sandwiched with Gilliland, the crash also impacted the cars of Jimmy Johnson, Carl Edwards and Michael Annett. Thankfully, Buescher was able to walk away from the accident and was interviewed after being checked out at the infield care center. At the halfway point, we saw 34 cars on lead lap with 11 leaders and 16 lead changes. Junior and Edwards crashed on lap 110 after Edwards had a tire go down turning his car to a hard right directly in Junior’s path leaving him nowhere to go. The fifth caution was caused by Kahne’s suspension breaking after he had returned to the track following an earlier crash in hopes of making up some laps and gaining points. With 59 laps to go, Hamlin again had issues on pit road when he spun and got into Landon Cassill’s car. David Ragan’s car brought out the sixth caution while Matt Kenseth was leading the race with 37 laps to go. With Keselowski leading with 28 laps to go, the pushing and shoving involved when Dega goes four wide resulted in the inevitable big one. For a few laps, Kurt Busch and Johnson were effectively drafting until Busch got into Johnson’s left rear sending him hard into the wall and taking out at least 17 cars and leaving only the 13 cars ahead of the wreck free of the carnage. At 20 to go, with Logano leading, a brief caution was called due to debris blowing off of damaged cars taped up and back on the track. After little more than ten green flag laps, a terrifying crash, with eight laps remaining, was caused again by bumping the left rear bumper. This time it was Michael McDowell bump drafting into Patrick who was pushed into Kenseth. Patrick hit the infield safer barrier with frightening force and Kenseth’s car was airborne catching the fence at the infield which kept his car on the track. All drivers were checked out at the care center and released. Going back to green to finish the race, the white flag waved indicating the final lap, yet there was still time for another caution which was caused when Truex and AJ Allmendinger made contact with each other and Cole Whitt turning Kevin Harvick into the wall. Ricky Stenhouse, Jr. was also involved in the final crash which occurred within 1,000 feet on the finish line. Leading at the moment of caution was Keselowski who, by NASCAR rules, was declared the winner. He was followed by Kyle Busch, Austin Dillion, Elliott, McMurray, Kurt Busch, Ty Dillion, Clint Bowyer, Ryan Blaney and Trevor Bayne rounding out the top ten. The top spot was shared by 17 leaders who exchanged the leader spot 37 times. The final count was 10 cautions for a total of 41 caution laps bringing the average speed of the afternoon’s race down to a mere 140 mph. If anything can be taken away from today’s race it is a commendation to NASCAR for its continued efforts to make the sport safer for the drivers, crew members and spectators. It is unimaginable how each of the crashes today would have ended so horrifyingly differently just 10 years ago. In a sport where speed is the name of the game it is essential that safety has taken the forefront. Action at Talladega Superspeedway resumes the weekend of Oct. 21-23, with the running of the Fred’s 250 Powered by Coca-Cola for the NASCAR Camping World Truck Series and the Alabama 500 for the NASCAR Sprint Cup Series. For ticket information, go to www.talladegasuperspeedway.com or call 1-877-Go2-DEGA.